new readers. I know a method that can cause a viral effect on your site. Concerning error, @AlanG, from your graphs I estimate a rough scatter of +/- 3.5C for cell 1.1 (comment #49) and +/- 0.5C for cell 1.0 (comment #33). I believe you did some filtering on the data in order to compensate for the possible mismatch in sampling with respect to the power step? To get a better sense of the actual recorded scatter, it would be nice to see the same graphs without any kind of filtering. Is there a way to indicate the error bars on the live feed somehow? I'm not sure exactly how this would be done -- perhaps the usual error bars, spaced every one or five minutes? I'm not a physical chemist, so I don't have any training or knowledge in this aspect, but do we have a way of tracking the hydride content of the wire during operation? Is there a way to do this? I need to have a run with the pressure held as constant as possible and at the same level as the calibration to verify these results. Also, it is important for a calibration run with an inactive wire that is guaranteed to not generate excess power in order to prove that the vertical system follows the same non linear differential equation. We may be getting the results that we seek, but it is a bit premature to celebrate. It is too bad that we are only seeing 1 watt or so, but the actual level needs to be more accurately determined. Ok, I took the very latest calibration step test for the cell FC0101 and used that to obtain the latest coefficients. These were then used with the latest full rising waveform step in power and I can say that the results are definitely different than I have seen in the past with earlier time domain runs. I am unable to make the temperature versus time waveform match the non liinear differential equation solution as before and the difference is not trivial and apparent. I am concerned about the fact that the pressure seems to be differernt for these two intervals of time so that might be an issue, but if not, there is definite evidence of something unusual with the latest test. If the Celani wire is loaded, then I suspect that we will be able to verify that extra power is being generated after more careful calibration. I estimate that the excess power is in the vicinity of 1 watt from a quick look at the fit. I'm noticing that the 1.1 cell is slowly gaining pressure although it's currently turned off. Wouldn't this imply a risk of air contamination when operating the reactor below 1 bar of pressure? Final chart of cycles 5-8 for cell 1.1. Something changed during the down ramp of the 7th cycle. Looking at the source data I can see that peak T_GlassIn dropped 8 degrees from the previous cycle, but none of the other parameters offer a clue why. The valid calibrations for the vertical cells all started about 21:00 gmt on Dec 21. The first two were at 0.5 bar H2. The next 8 were at 1 bar starting pressure. Yesterday we turned off cell 1.0 and then turned it back on. Today we turned off cell 1.1 and turned it back on. Then, tonight, we started with another 0.5 bar calibration cycle. The details are all in the experiment log. @Ryan, I took a quick look at the cell data for cell 102 and it is a bit different than the earlier calibration I obtained from the up/down stepping. The fit was not perfect, but a good start. 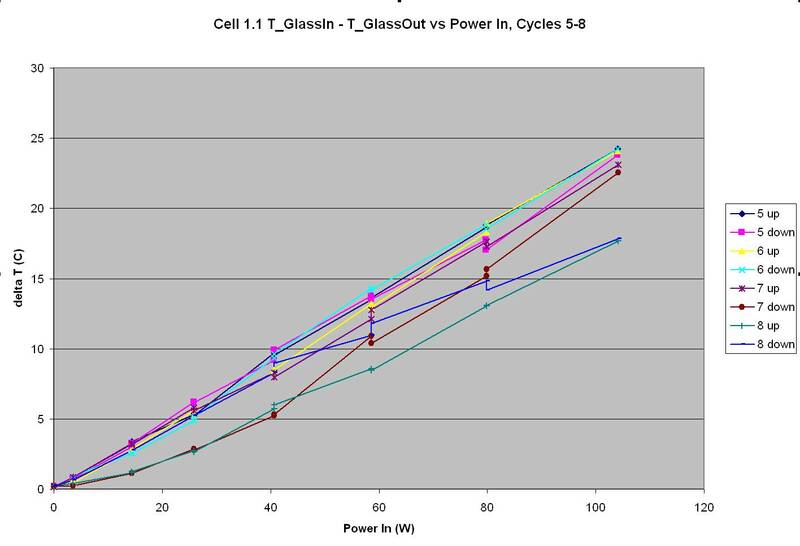 Could you list the times during which calibration data is valid for the vertical cell? I am a bit confused about what I have at the present time. My model is suggesting that the high level drive is at 106.5 watts which I assume is a bit high. The data I obtained did not state the power levels or times of change. Also, is the Celani wire used during any of this data run?